As minority language communities struggle with language loss, many scholars (Hinton & Hale, 2001; Johnson & Swain, 1997) and community activists (Kipp, 2000) now recognize immersion education as one of the primary means of restoring minority languages to community use. Nonetheless, immersion programs are not the only, or even the most common, program type currently in place in Alaska. Given the relatively small number of immersion teachers and the complex issues involved in language maintenance and revitalization, creating a Yup’ik immersion program is a daunting task for any community. This task is made all the more difficult by the lack of local (Alaskan) professional development opportunities for current and potential immersion teachers. Because nationally recognized programs specializing in immersion education lack coursework specific to the Alaskan context and require students to leave their communities, these programs can not meet the specific needs of Yup’ik immersion teachers. At the same time, a local program tailored exclusively to Yup’ik immersion teachers is problematic. The small number of students would make such a program unsustainable, and the narrow focus would exclude students interested in leadership positions in other types of language programming (both Yup’ik and English). In this article we discuss how one program (the Second Language Acquisition and Teacher Education Master’s program at the University of Alaska Fairbanks) is attempting to reconcile these needs. 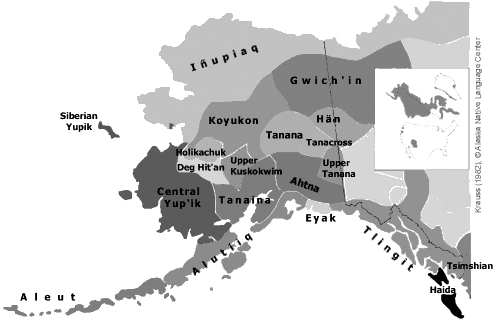 Central Yup’ik is a highly endangered language traditionally spoken throughout Southwestern Alaska. Roughly the size of Arizona, the “Yup’ik Region” has a combined census of approximately 23,000 Yup’ik Eskimos scattered in more than 60 villages. Transportation is limited to plane, boat and snowmobile, as none of the villages are connected by road. Only about one-quarter of all Yup’ik villages have large numbers of children growing up with Yup’ik as their first language (Krauss, 1997, p. 6). A broad range of Yup’ik language programs have developed within the more than sixty schools and nine school districts in the region. Today, program types range from language and culture enrichment programs, to transitional bilingual programs designed to facilitate acquisition of English by native speakers of Yup’ik, to immersion programs (including Hooper Bay School in Hooper Bay, Ket’acik Aap’alluk Memorial School in Kwethluk, and Ayaprun Elitnaurvik in Bethel) designed to facilitate the (re)acquisition of Yup’ik as an ancestral language. In 2006, a grant was secured to create an M.A. in Second Language Acquisition and Teacher Education (SLATE).1 Grant funds were designated for both program development (partner meetings, faculty time) and student support (tuition, fees, travel) for four Alaska Native Ph.D. students and up to twenty M.A. students from three partnered school districts (Lower Kuskokwim, Lower Yukon and Kuspuk). Given the relatively small population base and the broad range of program types, language needs and goals, a graduate program focusing exclusively on immersion teachers was considered both impractical and inappropriate. A broader program allows the M.A. faculty to recruit participants from immersion and traditional bilingual and English language programs from among classroom teachers and district administrators. Program faculty believe that a broader program allows immersion and non-immersion teachers important opportunities to develop common understandings regarding a variety of subjects, including (but not limited to) the goals and expectations of different program types (e.g., immersion, early/late exit bilingual education, English-only), the value and limitations of standardized testing, and the history and impact of Alaska Native/American Indian and bilingual education policy on local educational programs and outcomes. Given the many goals and multiple audiences for the SLATE program, faculty spent more than a year working with local community and district representatives to develop the relevant coursework (see course list below), delivery model, research paradigm, and recruitment process. Twenty M.A. students began coursework in Summer 2007. As of this writing, eighteen of this initial cohort are continuing with the program. These include six Yup’ik immersion teachers, four non-immersion Yup’ik language teachers, and eight English language development teachers. A strictly traditional model, which typically assumes full time on-campus study and independent student work and research projects, will not work for the sociolinguistic context described above. Any program must recognize that Alaska Native students historically have had difficulty completing graduate degrees, in part due to the fact that they are place bound, residing in isolated villages accessible only by plane, boat or snowmobile. In addition, our experience working with Alaska Native students suggests that collaborative learning environments are generally preferred by many students. This preference may have the effect of compounding the relative isolation of the student in traditional programs, further hampering degree completion. In an effort to overcome these obstacles, SLATE creatively addresses both course delivery and mentoring/research. For course delivery, we are able to take advantage of the University of Alaska’s experience in delivering classes using summer intensive and distance education courses in which cohorts of students move through the program together. We have expanded this cohort model to the realms of mentoring and research through the Guided Research Collaboratives (GRCs), which are explained in more detail below. While the program requirements (see below) are similar to those of existing Applied Linguistics or TESL programs throughout the nation, our SLATE program meets the needs of immersion teachers through a) the addition of specific coursework to help students understand and investigate issues relevant to them, their communities, and their schools, b) modification of course content to focus on second language acquisition of children, bilingualism and issues of language, culture and identity in language learning, and c) establishment of cohorts for course delivery. Each of these is described in detail below. LING 600—Research Methods for Applied Linguistics—3 cr. LING 601—Principals of Linguistic Analysis—3 cr. LING 602—Second Language (L2) Acquisition—3 cr. LING 610—Theory & Methods of L2 Teaching—3 cr. LING 611—Curriculum & Materials Development—3 cr. LING 650—Language Policy and Planning—3 cr. LING 695—Multiliteracies in the L2 Classroom—3 cr. One elective approved by graduate committee—3 cr. Within the Yup’ik context (as well as the Alaska Native context more generally), it is necessary to address the complex questions of language loss, language revitalization, and the appropriate roles of English and Yup’ik (and other Alaska Native languages) in modern society. With more communities turning to immersion programs in their attempts to address these issues (1/3 of SLATE students are immersion teachers or administrators), it is necessary for SLATE to address the specific needs and concerns of immersion schools in the Alaskan context. Although issues of language loss and language revitalization are addressed through most of the coursework, one course in particular is dedicated to these topics. In Language Policy and Planning students are exposed to a variety of models describing and addressing language loss and revitalization (e.g., Fishman, 1991; Hinton & Hale, 2001; Krauss, 1992; Paulston, 1994). In addition, students explore the history and current state of U.S. and Alaskan language policy and the intimate tie between that policy and bilingual education (e.g., Alton, 1998; Cooper, 1989; Crawford, 2004; Marlow 2004). Within the context of immersion education in Alaska, these topics are essential to understanding the Alaskan educational context. In another course designed specifically for the SLATE program—Multiliteracies, students extend the notion of literacy beyond the written word to include oral narratives, visual performance, as well as song and dance. This broadening is particularly relevant to our context as Yup’ik culture is grounded in an oral tradition involving not only story telling, but also expression through Yup’ik dance and singing. The immersion schools, in particular, base their curriculum on Yup’ik values and ways of life, in which these forms of literacy are of central importance. The content of each course in the SLATE program has been tailored to address both the specific needs of immersion teachers and colleagues teaching in different language programs. In the context of language loss and revitalization within which the language programs in the Yup’ik region operate, the focus is naturally on the processes of child second language acquisition in immersion and other instructed settings rather than on adults learning in a naturalistic setting. Because one of the overarching goals of Yup’ik language programs is to allow students to make the most of both worlds, discussion in several of the courses centers on bilingualism: types of bilingualism; cognitive and social effects of bilingualism; factors fostering bilingualism; instructional models fostering bilingualism; bilingualism, code-switching and language loss; bilingualism and bi-dialecticism. A third theme that is incorporated into the SLATE program more so than in similar programs nationally and internationally is an emphasis on the connection between language, culture and identity in language learning. In some cases purposeful grouping within the courses allows immersion teachers to engage in in-depth discussions of topics relevant to their unique situation. For example, in the Curriculum and Materials Development course, much of the class time is spent in small group discussion by school setting. In this way, all immersion teachers work together for extended periods of time. This collaborative work fosters a sense of an immersion cohort and also results in a willingness to share materials between the immersion schools. The Theory and Methods of L2 Teaching course takes this concept one step further as it is taught in two separate sections: one for Yup’ik language teachers and one for English language teachers. The number of sections offered in the future will inevitably depend on the makeup of the cohort. In an effort to foster collaborative research, students are organized into four Guided Research Collaboratives (GRC). Each GRC is focused on a general area of research (classroom pedagogy, multiliteracies, assessment, and language planning); each is headed by a faculty member; and each consists of one Alaska Native Ph.D. student and up to five M.A. students. GRC meetings are held bi-weekly. These regular GRC meetings facilitate the development of individual and group research agendas, and allow for continued exchange among peers, Ph.D. students and faculty members. In an effort to connect course content directly to research, M.A. students are encouraged to adapt individual course assignments directly to their intended research. Classroom Pedagogy: A second grade teacher-researcher from Ayaprun Elitnaurvik is investigating the role of singing in the acquisition of Yup’ik. Specifically, the teacher-researcher will investigate whether or not singing can help students to learn to understand and use the genitive case in Yup’ik. The researcher believes the input from songs will help her immersion students to pay attention to the proper grammatical forms (focus on form) and ultimately acquire them. Multiliteracies: A kindergarten teacher-researcher from Hooper Bay Immersion School is investigating the acquisition of Yup’ik literacy skills among her students. Specifically, the teacher-researcher will investigate whether or not the child’s acquisition of Yup’ik literacy facilitates the acquisition of English literacy without additional instruction by the teacher-researcher. The research includes frequent home visits to determine the range of literacy practices used in the child’s home. Assessment: A third grade teacher-researcher from Hooper Bay Immersion School is conducting an assessment of the immersion program in Hooper Bay. Specifically, the teacher-researcher will 1) investigate whether or not the immersion program meets Johnson and Swain’s (1997) definition of an immersion program, as well as 2) identify local goals for the program and assess whether or not the program is succeeding in meeting those goals. Language Planning: An English Language Development teacher-researcher from Mikelngutt Elitnaurviat (an English medium school in Bethel), is investigating parental choice between English-medium and Yup’ik immersion schooling. Specifically the teacher-researcher, herself a parent of both an English-medium and a Yup’ik immersion elementary student, will investigate parental attitudes toward schooling, Yup’ik culture/identity and definitions of ‘success’ in order to determine the major drivers behind choice in medium of instruction. As the SLATE grant enters its third and final year for student funding, we can begin to see the impact our program is having on immersion teacher education in the Yup’ik region. Of the 20 master’s students, 18 are still in the program, including all 6 immersion teachers. This retention rate is very high for a program serving full time rural teachers. Moreover, all students are collecting data for their thesis research and are on track to graduate within the year. Networking with other immersion programs sounds exciting and workable for me and my students. In fact, during one of our class discussions, my colleagues and I discussed with excitement how beneficial networking would be in our programs. We made a pact then that we will follow through with our plan. 1. The SLATE program was developed with U.S. Department of Education funding received in September 2006. Program faculty include Dr. Sabine Siekmann, Principal Investigator, Classroom Pedagogy; Dr. Patrick Marlow, Co-Principal Investigator, Community Language Planning; Dr. Joan Webster, Multiliteracies; Dr. Marilee Coles-Ritchie, Assessment. Ph.D. students include Hishinlai’ “Kathy Sikorski”, Language Pedgogy; April Laktonen-Counceller, Community Language Planning; Theresa Arevgaq John, Multiliteracies; and Stephen Walkie Charles, Assessment.